1. Don't forget to sign up for a Linky. You can sign up here. 2. Link up your blogs so we can follow you. 3. Visit and follow as many blogs as you wish! 4. Leave a comment below and a link to your blog! 4. Don't forget to share this hop on Facebook and Twitter, which in turn helps more bloggers find this hop and increase our followers! Just stopping by to say hi! 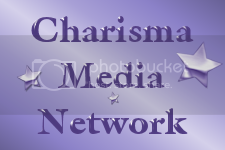 I am so glad that you are a part of Charisma Media Network! Hello dropping by via the hop! Love Love .... Once Upon A Time!! I've been watching this one too. :) I'm ready for the storyline to come back to Emma, which it looks like it is about to. :) Thanks! Debbie, thanks for stopping on by! I'm simply in love with the show now. Beforehand I just liked it, but once the Mad Hatter appeared I was IN LOVE! Melissa, same here. I just want her to believe. I absolutely love this show!!! It will be interesting to see what finally causes Emma to believe in the curse.